SenSura Flex Two-Piece appliances combines the unique, double-layer adhesive with a removable pouch connected to the baseplate by the adhesive coupling. The coupling is soft and flexible, which gives greater freedom of movement. 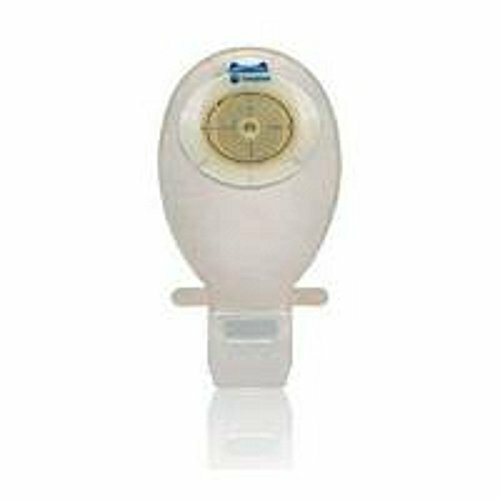 SenSura Flex Two-Piece open bags are primarily for people with an ileostomy. The double-layer adhesive is skin friendly and resistant to erosion from stoma output and body fluids. The coupling plate has a clear, blue line for easy alignment of the bag and baseplate. The Floating Fflange allows easy application of the bag to the baseplate with little pressure on the abdomens. Visible cutting guide. The removal ear makes it easy to remove the adhesive without leaving residues on the skin. The coupling is made of a soft and flexible adhesive which improves wearing comfort and gives you greater freedom of movement. The integrated security channels gives extra security against leakage. The bag has an integrated wave filter that allows the air to flow to help keep your bag discreet. The soft, nonwoven fabric is strong and water repellent. The outlet is easy to empty and clean. The outlet can be folded up and hidden away without the need for bulky clips. If you have any questions about this product by SenSura, contact us by completing and submitting the form below. If you are looking for a specif part number, please include it with your message.